The Cobblers have sold out their 2,000 ticket allocation for Saturday’s mammoth Sky Bet League One clash at relegation rivals Walsall. Town go into the game off the back of two wins, over Bury and Plymouth Argyle, results that have given Dean Austin’s men a genuine chance of avoiding the drop. The Cobblers remain third bottom but are just two points off the safety mark, with Tuesday night’s results going their way. Oldham Athletic and Rochdale both used up their final game in hand on Town, with the Latics losing 3-0 at home to Southend United, and Rochdale drawing 1-1 with Plymouth at Spotland. 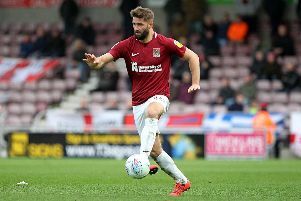 Those results mean Rochdale in 19th, Walsall in 20th and Oldham in 21st are all on 48 points, with the Cobblers on 46, with two games of the season remaining. A win for Town at the Bescot Stadium on Saturday will definitely see them leapfrog the Saddlers in the league one table - although Walsall have a game in hand at Bradford City next Tuesday night - and could even see them get out of the bottom four if Dale and Oldham lose their games against Oxford United and Doncaster Rovers respectively. The club have announced this afternoon (Weds) that the allocation has been sold. A club statement read: “This game has now sold out with no further tickets available, although a waiting list is in operation for any tickets that may be returned.